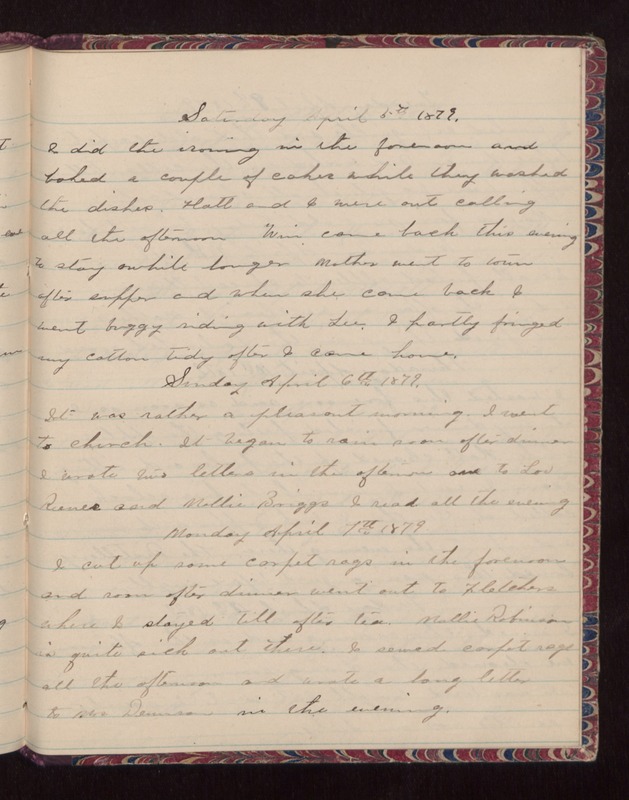 Saturday April 5th 1879 I did the ironing in the forenoon and baked a couple of cakes while they washed the dishes. Hatt and I were out calling all the afternoon. Win came back this evening to stay a while longer. Mother went to town after supper and when she came back I went buggy riding with Lee. I partly fringed the cotton tidy after I came home. Sunday April 6th 1879 It was rather a pleasant morning. I went to church. It began to rain soon after dinner. I wrote two letters in the afternoon one to Lou Reeves and Mollly Briggs. I read all the evening. Monday April 7th 1879 I cut up some carpet rags in the forenoon and soon after dinner went out to Fletchers where I stayed till after ten. Mollie Robinson is quite sick out there. I sewed carpet rags all the afternoon and wrote a long letter to Mrs. Dennison in the evening.